The US National Hurricane Center (NHC) is issuing advisories on Tropical Depression Fourteen, currently in the far eastern Atlantic, which is forecast to become a tropical storm. At 5:00 a.m., the centre of Tropical Depression Fourteen was located near latitude 10.6 North, longitude 27.3 West - about 435 miles (700 km) south south-west of the Cabo Verde Islands. The depression is moving toward the west near 15 mph (24 km/h), and this motion is expected to continue during the next couple of days. The depression is forecast to become a Tropical Storm later today or tomorrow. The estimated minimum central pressure is 1008 mb and there are no hazards affecting land at this time. The NHC is also issuing advisories for Tropical Storm Jose, located over the southwestern Atlantic Ocean, which is expected to produce high surf and life-threatening rip currents along portions of the US East Coast. 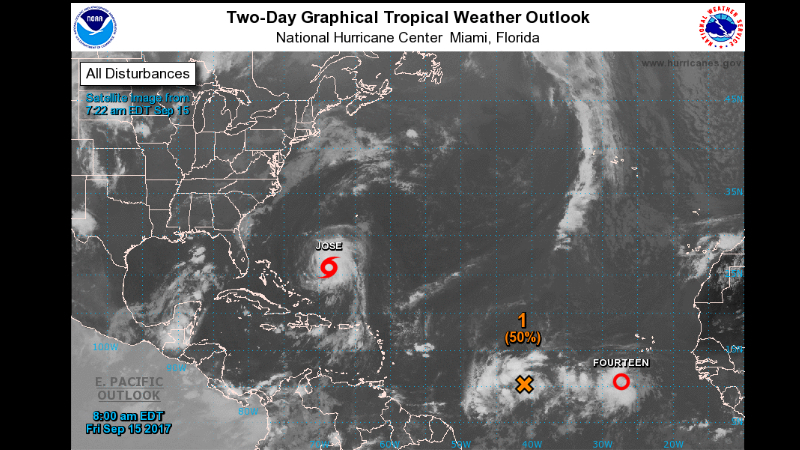 Elsewhere over the Atlantic basin on Friday morning, a tropical wave is located about 1,200 miles east of the Windward Islands, producing a large area of showers and thunderstorms, said the NHC. 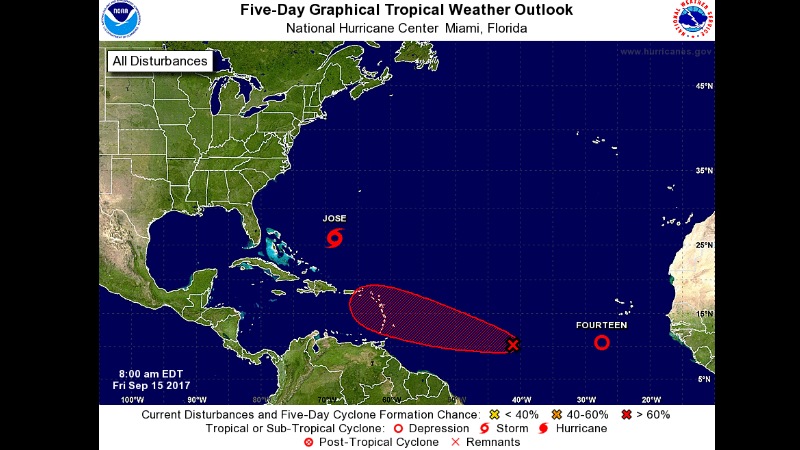 Environmental conditions are expected to be conducive for gradual development, and a tropical depression is expected to form in 2 or 3 days. The NHC advised interests in the Lesser Antilles to closely monitor the progress of this system while it moves westward to west-northwestward at about 15 mph. 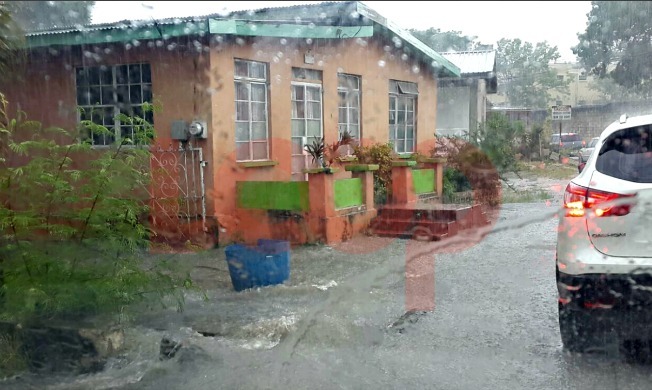 Meanwhile, in its outlook for the Eastern Caribbean issued Friday morning, the Barbados Meteorological Services (BMS) said a trough system will begin to affect Barbados and most of the Windward islands initially, with an increase in moisture and instability across the entire island chain by tonight as this trough system moves across the Eastern Caribbean. During this time, there is the possibility of some showers and isolated thunderstorms across the region. 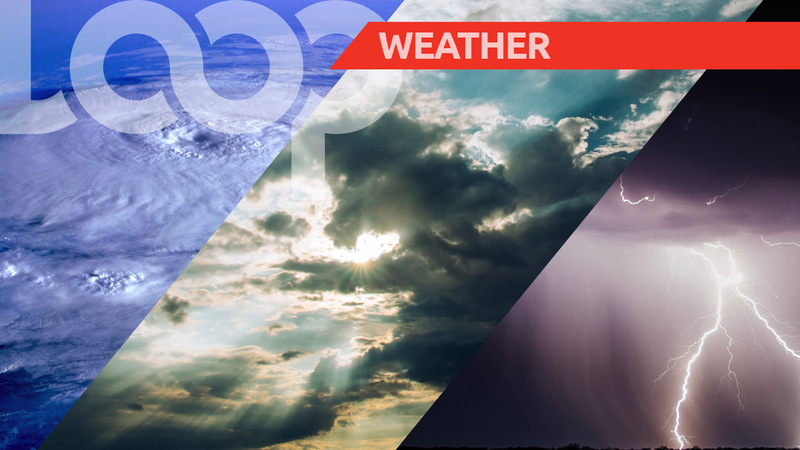 The BMS predicted some rain on Saturday, mainly over the northern Windward Islands and noted that by late Saturday into Sunday, a high-pressure system is expected to be dominant across the entire region, with breezy conditions and a few showers across the island chain. However, by mid to late Sunday, a tropical wave is expected to begin affecting Barbados and then most of the region by early Monday. “Current analysis is suggesting that there a great chance of tropical cyclone development by this time, so of course the BMS will continue to closely monitor this feature,” said the BMS. It added that regardless of development of the system, generally cloudy to overcast skies, moderate to heavy showers, periods of rain, occasional gusty winds and isolated thunderstorms, are likely across the island chain. This activity is expected to persist through to Tuesday.